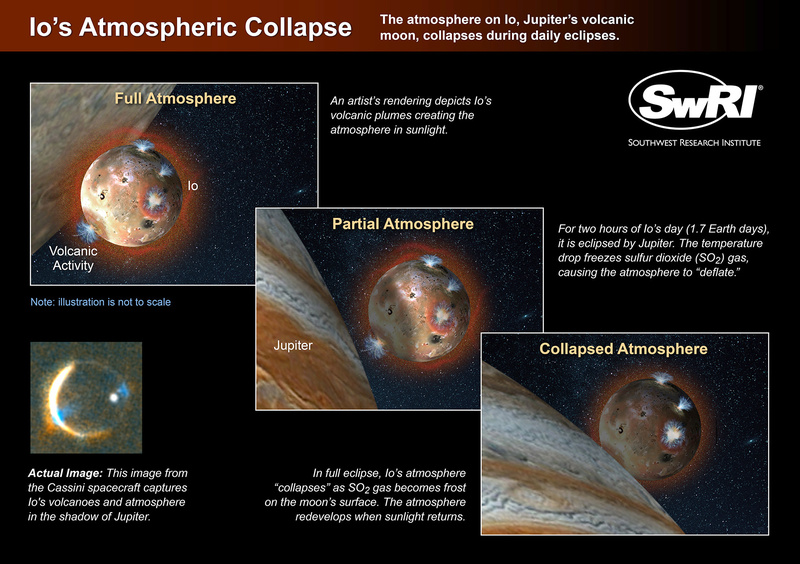 An artist’s rendering depicts the atmosphere on Io, Jupiter’s volcanic moon, as it collapses during daily eclipses by Jupiter’s shadow. Click image for a full-size version. Illustration credit: Southwest Research Institute. A team of scientists has documented atmospheric changes on Io, Jupiter’s volcanically active satellite, as the giant planet casts its shadow over the moon’s surface during daily eclipses. A new study concludes that Io’s thin atmosphere, which consists primarily of sulfur dioxide (SO2) gas emitted from volcanoes, collapses as the sulfur dioxide freezes onto the surface as ice when Io is shaded by Jupiter. When the moon moves out of eclipse and ice warms, the atmosphere reforms through sublimation, where ice converts directly to gas. “This research is the first time scientists have observed this phenomenon directly, improving our understanding of this geologically active moon,” said Constantine Tsang, a senior research scientist in Southwest Research Institute’s Space Science and Engineering Division in Boulder, Colorado, and lead author of the new study. The findings were published in a new study in the Journal of Geophysical Research-Planets, a publication of the American Geophysical Union. The team used the eight-metre Gemini North Telescope in Hawaii and the Texas Echelon Cross Echelle Spectrograph (TEXES) for this research. Data showed that Io’s atmosphere begins to “deflate” when the temperatures drop from −235 °F (−148 °C) in sunlight to −270 °F (−167 °C) during eclipse. Eclipse occurs 2 hours of every Io day (1.7 Earth days). In full eclipse, the atmosphere effectively collapses as most of the sulfur dioxide gas settles as frost on the moon’s surface. The atmosphere redevelops as the surface warms once the moon returns to full sunlight. Io is the most volcanically active object in the solar system. Tidal heating, the result of Io’s gravitational interaction with Jupiter, drives the moon’s volcanic activity. Io’s volcanoes emit umbrella-like plumes of sulfur dioxide gas extending up to 300 miles above the moon’s surface and produce extensive basaltic lava fields that can flow for hundreds of miles. 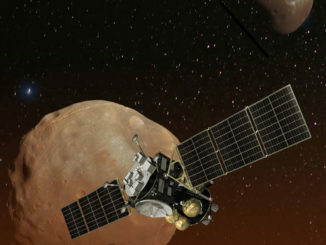 This study is also timely given that NASA’s Juno spacecraft entered Jupiter orbit on 4 July. Setting up post at the king of planets, NASA’s Juno spacecraft fired its main engine for 35 minutes Monday, steering into orbit around Jupiter to peer inside the gas giant and give scientists a better idea of how the solar system took shape 4.6 billion years ago. 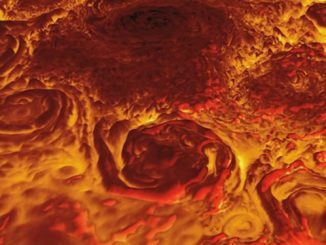 Using infrared data from NASA’s Juno spacecraft, scientists have assembled a 3D map of Jupiter’s north polar region, showing details of a huge central cyclone and eight surrounding storms. 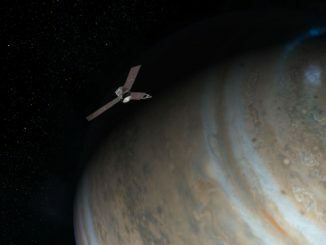 Juno also is shedding light on Jupiter’s powerful magnetic field.